Overlooking Hyde Park, the Marriott-owned Grosvenor Hotel is home to Richard Corrigan's flagship fine dining restaurant, the JW Steakhouse, and the Bourbon bar which has London's largest collection of bourbons. The Great Room is the largest hotel banqueting space in Europe. When a hotel overlooks one of the Royal parks, it is only right that it should be utterly English. 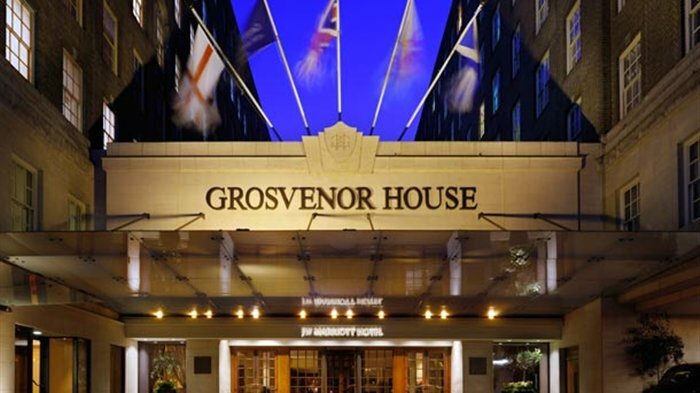 The Grosvenor House, first opened in 1929 and rebranded as a JW Marriott Hotel in 2008 following a four-year multi-million pound restoration programme, has an elegant, classic style that feels like stepping into the aristocratic past. The Great Room, originally built as an ice rink, was where Queen Elizabeth II took ice skating lessons as a child, and guests enter the hotel through original Lutyens wrought-iron gates. Taking up eight floors, the large 420-room hotel has 74 suites including the most luxurious Hyde Park-facing Premium Park View Suites in the corners of the hotel. Take afternoon tea in the café, ride a horse in Hyde Park, or stroll around the exclusive boutiques of Bond Street before returning to enjoy 21st century facilities with traditional style. The quintessential treat is served in the tranquil Park Room & Library. Served in The Park Room & Library, guests enjoying afternoon tea at the Grosvenor House Hotel are treated to beautiful views across Hyde Park. The British stately home setting provides the perfect place to enjoy a quintessential afternoon tea, offering a tranquil environment away from the bustling Park Lane. Delicate finger sandwiches are served alongside freshly baked buttermilk scones with Devonshire clotted cream and Cornish strawberry jam. While a range of seasonal cakes and delicate pastries take pride of place at the top of the tier. The Grosvenor also offers a wide choice of loose leaf teas from around the globe, or for special occasions can opt for Champagne Afternoon Tea of Hendrick's Gin Afternoon Tea. Located within luxury hotel Grosvenor House, JW Steakhouse serves tender hand-cut selections of dry-aged American USDA prime beef, grilled to perfection. Diners can choose from a variety of cuts, including filet, porterhouse, rib eye, New York strip and hanger steak. A range of classic dishes such as fish and chips, spot roast chicken and grilled lobster are also available, while 'the best cheesecake this side of the pond' leads the way on the dessert menu. Priced at £14, expectations are high but having received cult status and its own twitter hashtag, guests are sure to not be disappointed. Further pudding options include warm apple pie, Mississippi mud pie and peach cobbler - all priced at the more reasonable cost of £8. Richard Corrigan presents a game-y menu that tugs at his Irish country roots. He got his first Michelin star at Stephen Bull's Fulham Road restaurant in 1994, the second at Lindsay House in Soho in 1997 and with this smart Mayfair establishment Irishman Richard Corrigan he certainly looks set for a third. He's also responsible for the popular Bentley's Oyster Bar and Grill but Corrigan's Mayfair is an altogether more elaborate dining experience, appealing to Mayfair's moneyed diners. It's a long way from farming country in County Meath where Corrigan grew up, learning an intrinsic understanding of seasonally changing ingredients. The game-y menu tugs at his Irish country roots; mains like grouse pie and roe venison come with sides of things like earthy cep mushrooms and pickled cabbage. Serious dining and all done with the flair for which Corrigan is well known. A striking bar with a vibrant red interior. With its vibrant red interior, the Red Bar at Grosvenor House Hotel is "a high-camp confection of crimson lacquer and red leather, which feels like sitting inside a jewellery box" (The Guardian). This distinctive venue has become one of Mayfair's most iconic destinations and is the place to go for late night cocktails and the chance to bump into one of the hotel's A-list clients - the Great Room next door regularly hosts star-studded soirees. Open from the afternoon into the early hours, it has a bar food menu and a selection of wines and beers alongside playful cocktails like the Red Viking, the Strawberry Basil Martini, and the Perfect Sling, a smoother, sweeter version of the Singapore Sling. The relaxed atmosphere makes it an ideal spot to relax while looking out over Hyde Park, and its intimate areas are a great option for small social gatherings and parties. A VIP Lounge is also available to hire and the bar can be used exclusively for private use. This bar is home to London's largest collection of bourbons. 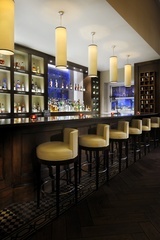 Part of the JW Steakhouse, the Bourbon Bar has the largest and most varied selection of bourbons in London. Guests can choose from more than 160 rare, pre prohibition, single barrel and small batch bourbons, or opt for one of their innovative tasting flights with the bar's very own Jack Daniel's Single Barrel. Away from the bourbons, there is also an eclectic cocktail menu that includes the signature Mint Julep, Kentucky Bourbon Sour and Mayfair Manhattan, as well as a number of seasonal options throughout the year. From cheap budget hotels to luxury 5 star hotels see our discounts for hotels, including The Caesar Hotel London from 76% off.